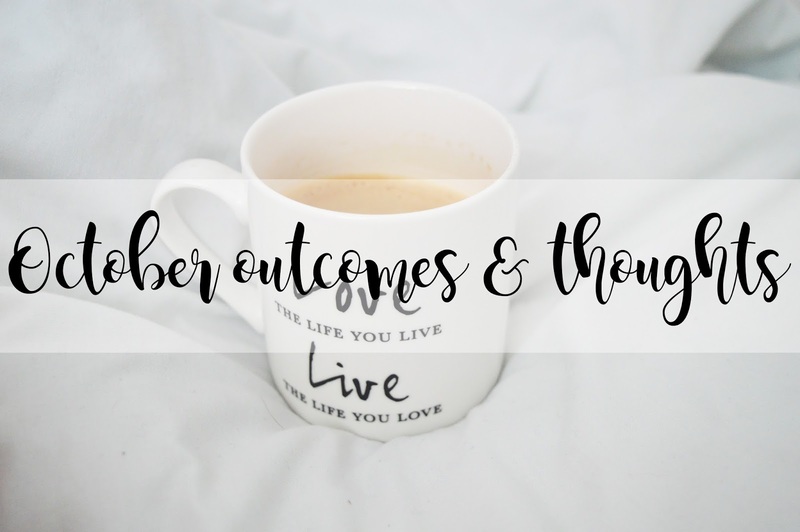 It is that time of the month again to share my thoughts and outcomes of the month which has just flown by. I really enjoy these posts because they are more for me so I can look back and see how much I have progressed throughout my time of blogging and it does bring me a sense of achievement too! It generally shocks me how quickly my blog is growing and it may seem like really small steps to other bloggers out there but for me, it's big steps and I couldn't be more proud of my blog and all the little things which go along with it! First things first; Twitter. I cannot believe how crazy quick my twitter following has been growing compared to before when I had no idea what the blogging community even was. I ended October with 2847 followers and I ended September with 2031 followers. Although I didn't gain as many followers as I did in the month of September, 816 is still a lot of people when you think about it. 816 people seeing my tweets.. crazy. (Writing this post, I'm 8 away from 3k, wooo). I can genuinely say the blogging community is absolutely incredible and without them, my blog wouldn't have grown the way it has in such a short space of time, so thank you! Secondly, my blog stats. I ended September with 27947 all time page views on my blog, compared to the last day of October, I ended with 37629; just under 10k page views within a month! Insane. (Writing this post, I am very close to 40k now). I remember back in July I was on less than 5k. To be here now, is a very overwhelming feeling and I never thought I would have made it this far with my blog! It's safe to say bloglovin is very very hard to grow and we all know this but with the help of the blogging community, it can be slightly easier! Throughout October I have gained 93 followers and I couldn't be more grateful! I remember I was on 10 for ages and it felt rather pointless having Bloglovin when only 10 people followed my blog. Things change when you least expect it! So do not worry! Last but not least is my wonderful Instagram. Recently I changed the theme of my instagram as I had no idea how I wanted it to look and I decided just sharing each blog post, every single day was a bit boring and I hated it! I now have a theme, which I have a love/hate relationship with but it has definitely helped to grow my account! On the last day of October before going to sleep, I had 388 followers, which is a gain of 149 people following my account within a month. I know, compared to my twitter this isn't many people; but it's an achievement! I am currently sitting at 505 I believe which I can safely say I feel proud of! I never thought I'd be able to grow any of my accounts, but for being myself; I have been able to do this. Do you keep track of how your blog is growing? Do you feel a sense of achievement at the end of each month? If you don't want to create a post like this; that's fine! But each month, jot down your stats for each account just before you go to sleep; you'll be surprised the outcome of each month of blogging. Are you a nail polish lover too? Head on over to Itsy Nails for 10% off using the code "Itsygirlkimberley"